It was clear that Jordan Lyles wouldn’t get the elusive no-hitter today after giving up a single to the first batter he saw. However, Lyles would never get in any real trouble in the game, allowing only a sacrifice fly in the third inning while striking out three batters in five innings. He even got an RBI in the fifth inning, dropping down a bunt with AJ Ellis barreling down the third-base line. Ellis slid in safely just ahead of the tag by Francisco Cervelli, and Lyle would be credited with a suicide squeeze. However, Lyles would run into trouble the following inning, as, after walking Colin Moran with two outs, Austin Meadows uncorked his first home run of the season off of a 2-2 curveball from Lyles. Jordy Mercer sent Lyles’ next offering, a 94 MPH fastball on the inside part of the plate, into the deep part of left field for a home run, and that would unfortunately be the day for Lyles as Andy Green called upon Matt Strahm to clean up the inning. Lyles, while certainly not getting anywhere near his last start against the Colorado Rockies, was still effective today, throwing 5 2/3 innings while striking out four and allowing four runs to cross. Three of those runs came from home runs and Lyles had been cruising for most of his start, walking only two despite throwing 93 pitches and only getting 57 strikes. Lyles will look to stay consistent in his next start. 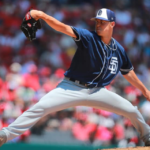 The Padres bullpen got the job done tonight, albeit while seemingly walking a tightrope greased with oil. Strahm would get out of the sixth inning with no problems, but he began the seventh inning by walking Gregory Polanco on a full count. 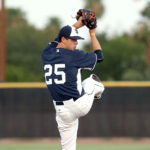 The lefty was able to escape the inning by inducing a flyout, pop out, and a lineout, in that order, to retire the side. Kirby Yates and his wipeout splitter was next, but he would immediately run into trouble by allowing back-to-back singles by Moran and Meadows. He struck out Mercer on a splitter below the knees, but he proceeded to plunk David Freese to bring up Josh Harrison, who already had three hits in the game. Yates would allow a run to cross after Harrison’s fly ball to center field, but he got a pop out from Villanueva to get out of the inning. Even the reliable Brad Hand would have to sweat out the ninth inning, walking the first batter of the inning on four pitches. He would settle down and retire the next two batters, but a walk to Sean Rodriguez and a fielder’s choice by Jose Osuna that somehow managed to advance all of the runners brought the winning run up to the plate in the form of Mercer. 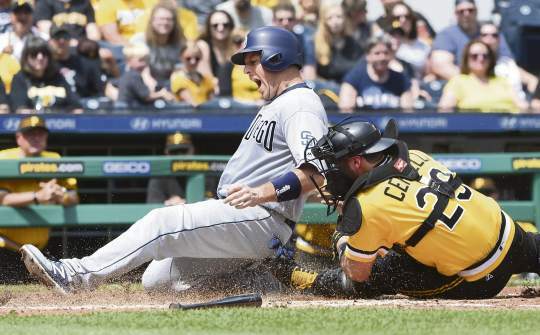 A scorching line drive was snagged by Cory Spangenberg at third base though, and the Padres were able to secure the win. While Green would certainly prefer his relievers not to give him gray hairs whenever they go out to pitch, he will gladly take the win. The San Diego hitters have been a lot different in this series. They are putting together quality at-bats, getting hits in crucial moments, and stringing together runs in fashionable ways. 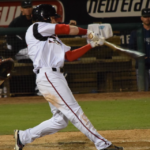 It started with a line drive two-run home run to center field by Christian Villanueva, who seems to be breaking out of his funk in May. 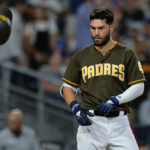 The fifth inning saw a Freddy Galvis single and an Ellis double lead to an RBI groundout by Manny Margot, while the Padres would stake a three-run lead after the Lyles bunt tacked on an extra run. 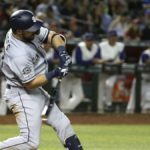 It was in the ninth inning that the Padres would show some true grit and form a rally, starting with back-to-back singles by Jose Pirela and Villanueva. A flat-footed throw by Mercer glanced off the glove of second baseman Harrison, and let Pirela score all the way from second. The Padres would score another run off of a bunt as Galvis dropped a bunt and was safe at first thanks to the late coverage of Harrison. 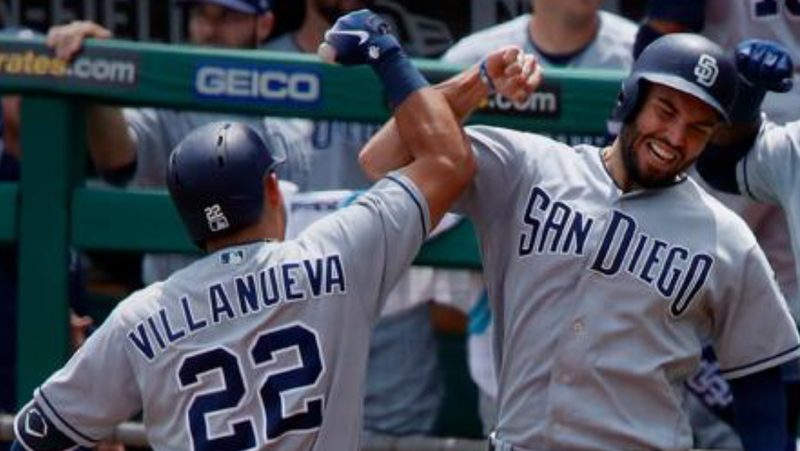 Two more runs would be piled on thanks to a base hit by Ellis, and the rally was complete as the Padres took the lead for good. 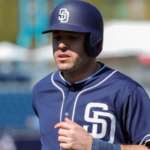 The Padres offense has scored 21 runs this series and have finally begun hitting as a unit, with timely hitting from players who have been cold for far too long. It will be exciting to see what happens when Wil Myers returns from his injury and how it affects the chemistry of the lineup. For now, let’s see if the Padres can continue this hot streak. San Diego is back on the road tomorrow as they square off with Bryce Harper and the Washington Nationals. 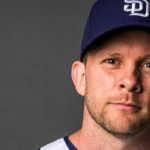 Robbie Erlin will take the mound for San Diego, while the offense will have to contend with Gio Gonzales. Previous Will We See Chris Paddack by the End of Season?